Juno’s first major information dump revealed some incredible insights into our big ol’ friend, Jupiter. A few close approaches from the NASA spacecraft show that the gas giant has extremely chaotic storms and can generate aurorae in ways Earth can’t, among other oddities. In short, Jupiter is the wild west of the solar system, and an incredible view of its rings proves just how true that is. An image captured by Juno on its August 27, 2016 flyby and featured in a NASA press release last week shows an unprecedented look at the Jovian ring system from inside them. 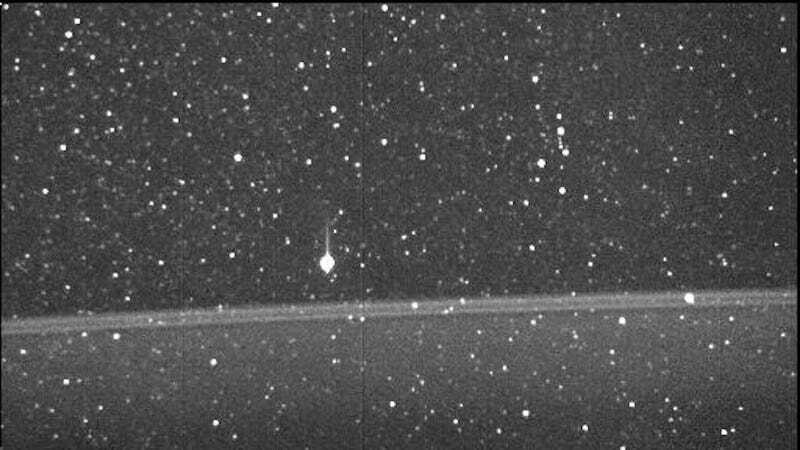 Though the Voyager 1 spacecraft first discovered the four-part ring system back in 1979, this view is especially breathtaking, considering it’s the only photo of Jupiter’s rings from the inside, according to Space.com. You can also see the dying star Betelgeuse—from the constellation Orion—totally photobombing this with its unmistakable glow. Way to be an attention hog, Betelgeuse. An eclipse of the sun by Jupiter, with the rings visible as reflected sunlight. Image: NASA, JPL, Galileo Project, (NOAO), J. Burns (Cornell) et al. All the gas giants in our solar system’s have rings, though Saturn’s rightfully get the most attention. This is because Saturn is clearly the best, and anyone who tells you otherwise is wrong. Jupiter’s rings are trickier to see because they’re much smaller than Saturn’s, and are made of dust from meteors colliding with Jupiter’s inner moons. It’s sort of a downgrade from Saturn’s icy, light-scattering beauties, but still pretty cool I guess. Jupe-enthusiasts will be glad to know we’ll be getting a lot more info back before Juno’s mission ends in February 2018. Until then, we can drool over pictures of the planet over at JunoCam’s site.